I have a soft spot when I see recipe with the word “everyday” and “yogurt”. “Everyday” means fuss free, “yogurt” means healthy, moist, low fat to me. So when I saw Lena posted this Everyday Yogurt Cake from Lauren Chattman, I was sold. This cake happens to be this month’s Bake Along cake, so it gives me another reason to bake it. To make it more interesting, there is debate among the bloggers who have baked this cake. Some like it, some don’t. Some say good, some are disappointed. I decided to halve the recipe (just in case I don’t like it) and use my new silicone mould for this cake. When the cake was just out from the oven I agreed with Lauren Chattman that it was light and airy (in fact I thought it was very airy to me as compared to other yogurt cakes I made before) but I wouldn’t say it was moist (considered very little amount of fat was used it was not bad though). I also liked the slight crispy crust. However, the cake became a bit dense on the next day and the crust became slight chewy. Nobody in my family seems to like it. So I would recommend this cake only if you are having it on the same day it is made or best is to have it when it is freshly out from the oven. Below is half of the original recipe with sugar reduced (but I still find it a bit too sweet) which I adapted from Lena’s blog, yield a 6” round cake. 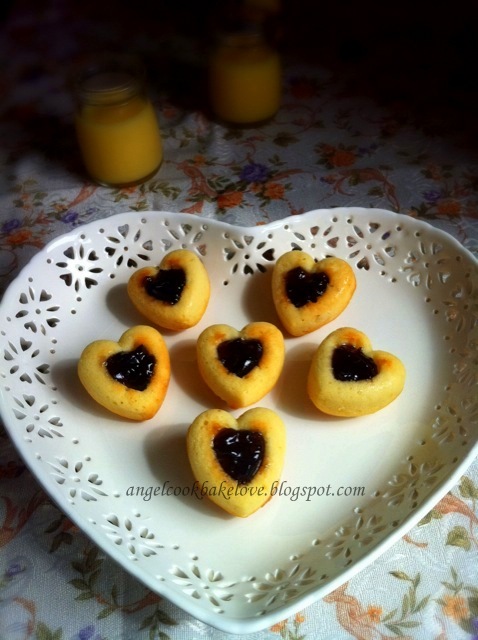 I managed to yield 12 mini heart shape cakes and 9 mini donuts. I shall share the mini donuts in my next post. You can find the original recipe from here. 1) Whisk together the flour, sugar, baking powder, baking soda and salt in a mixing bowl. Whisk together the yogurt, oil, eggs and vanilla in a medium mixing bowl. Pour the yogurt mixture into the flour mixture and stir until just moistened. 2) Scrape the batter into the prepared pan and bake until top of the cake is light golden and a cake tester inserted into the center comes out clean. 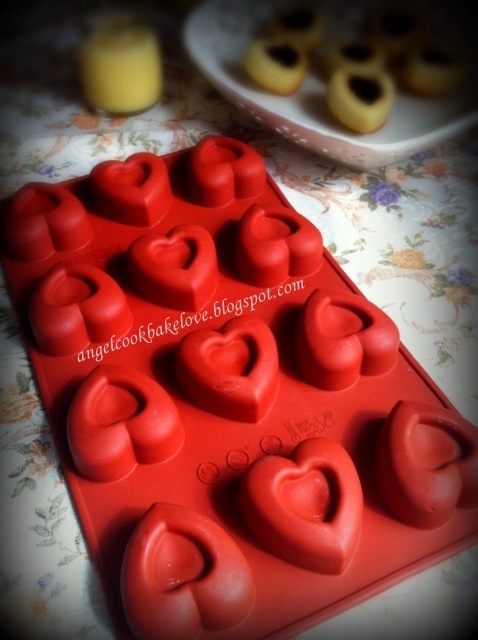 For my mini heart shape silicone pan I based at 190C for 20 mins. 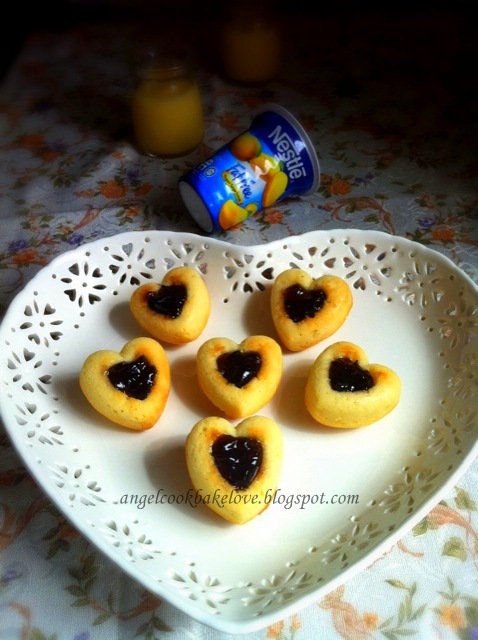 Serve with fruit jam. This is the silicone mould I used for this cake. Don’t you think it is lovely? Check out other bakers who have made this cake below. Very nice yogurt cake and nice mould. I like this mould.. Thanks. I like my new plate too. Thank you. I lthink the mould makes the cake look pretty. hi angel, yeah, some mixed reactions from fellow bakers who baked this. I think you did a much better job than me as i did not find mine as airy as yours. Anyway, really glad that you tried and made it to our bake along! thanks! You cake looks very airy to me. You have done a good job too. I will try to join the bake along event if I can. Love the idea of this event. I like your mould! so romantic:D Great idea to fill it with topping to glam up an otherwise plain cake! Thanks to the design of the mould. Lovely cakes! 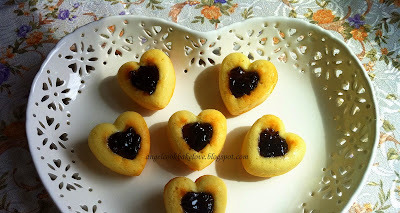 It is nice to see how one recipe can give different ideas of baking! Your silicone mould is very nice! Thank you for baking along with us! It's my honour to join the Bake Along. It's the interesting part of the Bake Along event to see different ideas/thougts/presentation using the same recipe. Your cake is so lovely. Like your silicone heart shape mould and your pretty plate. I too have made this cake yesterday. Hi Angel, your cake look so cute, yum yum. Love your plate and silicon heart shape mould, look so lovely. Nice to see this cake baked in the form of little heart shapes. Since you are adding jam onto the cake, I think you are doing right reducing the sugar content of this recipe. Saw your description of your cake and sort of nod as I read... My cake is ok to eat on the day when it was freshly baked but wasn't as good on the next day of bake. Nice to know you through Bake Along! Love your blog. Hi Angel, dropping by via the Bake Along. Its a good idea to top it with jam, I think it really enhances the flavour. Thanks for dropping my blog. The jam in fact compliments the yogurt cake. wow ur cake looks so cute..
Btw do u have any recommendation for the oven ? cos i plan to get a new one. Which model of oven are u using ? What kind of oven you are looking for? Built-in or tabletop? Besides the type I think it also depends on your budget. I am using a cheap tabletop oven from Tecno brand. So far no complain. For built-in oven these are some of the brands I know which are popular among home-bakers, Bosch, Teka, Ariston. For this recipe, just use hand whisk will do? Yes. Use hand whisk will do.